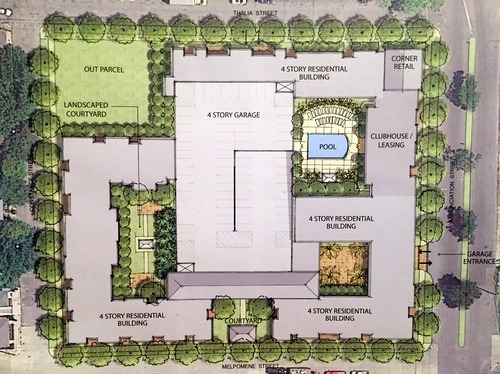 Lower Garden District residents have mixed emotions about the 211-unit apartment complex proposed to replace a former grocery store, but some are just appreciative it’s not a big-box retail store. Edwards Communities, the Ohio-based developer behind the proposed Lafitte Greenway apartment complex, is planning a four-story development in a shuttered Robert Fresh Market grocery. The proposed complex – located at 1301 Annunciation St – will have 211 units available for rent, according to Stephen Caplinger of CAPLINGER Design and Planning, an associate of Edwards Communities. Plans include a corner space for retail, a four-story garage and several outdoor courtyards. 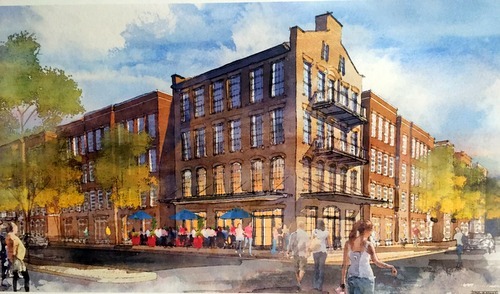 “We have a really good design flow, and we totally understand the importance of the community in this project,” Caplinger said to the Coliseum Square Association during their monthly meeting Monday. The shuttered Robert Fresh Market is cornered by Thalia and Melpomene streets, which some Coliseum Square members said were “quiet streets.” A residential complex would bring more foot traffic to the streets, though the number of apartments is a worry for neighbor Donovan Mohr. Mohr said 211 units is too dense for the limited space – even though it’s four stories – and hopes developers will stick to the feel of the neighborhood. Many of the area homes are single shotguns or cottage-style residences, with two stories at most. History is another concern for the 35-year Annunciation Street resident. “Nowhere (during the presentation) did they mention the history of the area; if they don’t respect the history of the neighborhood, then this project is dead to me,” Mohr said. The Annunciation Street Robert store never reopened after Katrina. Edwards Communities would maintain the property under a long term lease with Robert Fresh Market, said Avery Foret of Sherman Strategies, an attorney for Edwards. Coliseum Square members also raised concerns about increased traffic and parking issues that 200 more residences can bring. Jim McAlister, board member, said the large number of one-bedroom apartments can lead to less-permanent neighbors. “One of the scary things is, with one-bedrooms, you’re going to get a lot of transient people,” he said. McAlister also questioned where developers are going to put air conditioning and refrigeration mechanics and garbage dumpsters within the already-crowded complex. Coliseum Square members voiced concerns about preserving the feel of the neighborhood, which doesn’t include a row of dumpsters along a busy street. Many members said they were fine with a small retail space on the corner of Annunciation and Thalia streets, but the possibility of a bar or restaurant concerned some. Foret, the attorney, tried to quell some resident’s fears with the fact that nothing is set in stone just yet. “The plans are still evolving. They are by no means finalized,” she said. For neighbor Banks McClintock, a residential development isn’t the worst-case scenario for the blighted property. McClintock said he prefers an array of housing over a strip mall or big box store, but wishes the developer would cut down the number of units and height of the buildings facing Constance Street. But, all-in-all, McClintock said he’s just happy a new Best Buy won’t be moving into the area. “The best case scenario is a hotel, but at least it’s not a strip mall,” he said. 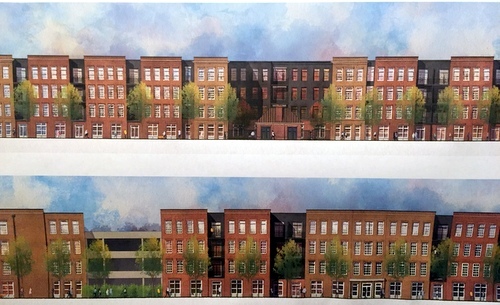 The proposal is headed to city planning staff. Have they seen the number of rentals and for sale signs in the area currently? I have never seen so many vacant rentals in the area!!! Abandoned building. CSA board members who now live outside of Orleans parish should consider withholding their opinion.